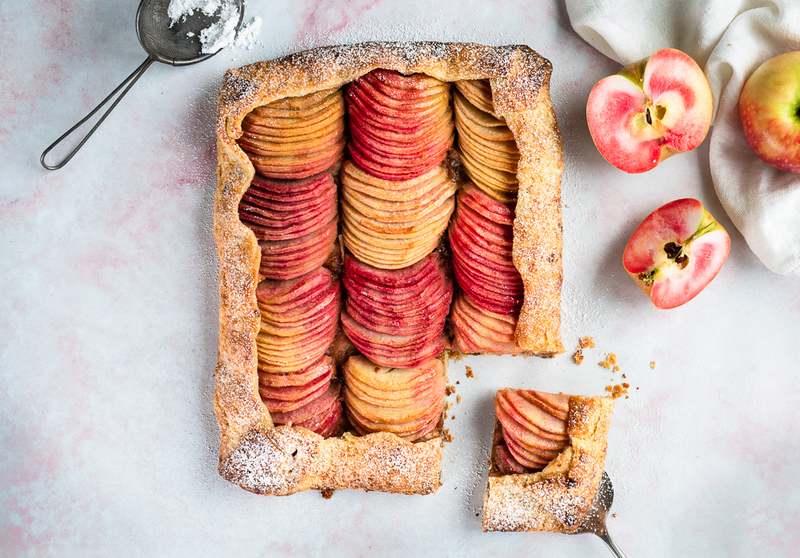 The new Lucy™ Glo and Lucy™ Rose apples create a stunning color contrast in our deceptively simple apple galette. Crumbled gingersnap cookies are added to the filling for extra warmth and depth of flavor, but they also serve to soak up the cooking juices and maintain a nice crisp crust. The two Lucy™ apple varieties are tart, sweet and juicy – just perfect for baking! The Lucy™ Glo variety shows off its gorgeous red color and adds visual interest to baked goods. In a large mixing bowl, combine the flour, sugar and salt. Add the cold butter and cut it into the flour using two knives until the mixture is coarse and butter is pea sized. Alternatively, work it into the flour with fingertips until the above consistency is achieved. Add the ice water and gently stir it in with a fork until dough just comes together. If the dough is a little dry, add more water, one teaspoon at a time. Once again, the dough should just come together. Take care not to overwork it or the dough will become tough. Preheat the oven to 400°F / 205°C. Combine the lemon juice and water in a medium bowl. Peel, core and thinly slice the apples, then place in the lemon water to prevent any browning. 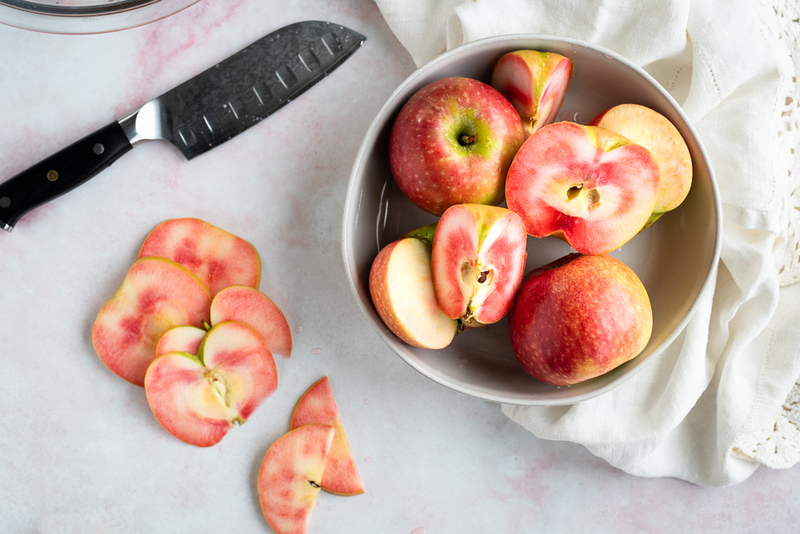 Drain and set the sliced apples aside on a tea towel or paper towel. On a parchment paper or silicon mat, roll the dough into a rectangle that is roughly 12×16 inches and 1/8 inch thick. Keeping the dough on the parchment paper or silicon mat, transfer the dough onto a sheet pan. Sprinkle the gingersnap crumbs over the dough, leaving a 2-inch border around the edges. Layer the apples on top of the gingersnap crumbs, then fold the edges of the dough over the side of the apples. Brush both the crust and the apples with the melted butter, then sprinkle with sugar. Bake for 45-50 minutes, until the crust is golden brown and the apples have softened. Serve warm. The galette is best eaten on the day it is baked. * The dough makes enough for 1 large galette or two smaller ones. **Other types of dry cookies can be used here, for example: amaretti, biscotti, digestives or dry store-bought chocolate chip cookies. This was sooooooooo darn good! This is BEAUTIFUL! I’m definitely going to find these apples and try this recipe. I’ll report back. I wasn’t able to use the Lucys, but I agree this is a solid recipe. KUDOS to you guy! Do you send alerts when there are new recipes? If so, stick me on it. Thank you for buying our LucyGlo apples and visiting our website! We love when people discover our LucyGlo apples and try our recipes.